We’ll be Donating 20+ Gypsy Gift Horses in 2018! NOMINATIONS: We are accepting nominations for all PATH premiere accredited EAAT centers and center members interested in receiving a Gypsy Horse through Gypsy Gift™ through 12 pm EST March 31, 2018. Nominations close at 12 pm EST March 31, 2018. To submit a nomination for a PATH Int. center member or premier accredit center, visit GypsyGift.com. VOTING: Daily voting (once every 24 hour period) will begin on LexLin Gypsy Ranch’s Facebook fan page at 12 pm (noon) EST on April 2, 2018. Daily voting will close at 12 pm (noon) EST on June 15, 2018. 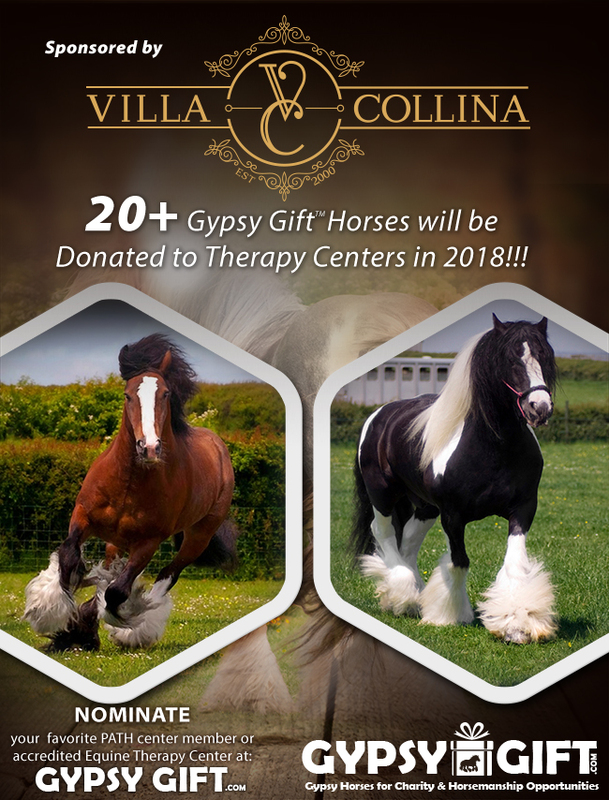 The top 20 nominated centers with the most fan “likes” on LexLin Gypsy Ranch’s facebook page will be able to select their Gypsy Gift Horse in the order of most to least votes received with the center receiving the most votes making the first Gysy Gift horse selection. Nominations will be posted for daily voting beginning at 12 pm EST on April 2, 2018. If a center has previously won a Gypsy Horse from LexLin Gypsy Ranch through our Gypsy Gift program they are not eligible to be nominated for a horse the subsequent year. They may however be renominated for Gypsy Gift the year after that. The twenty Gypsy Gift center recipients will be asked to provide transportation for their selected horses. The passing of the lead ceremony and our annual open house is scheduled for July 21, 2018. The twenty 2018 Gypsy Gift horses are all 2+ years of age and will be ready to immediately enter into a donation agreement with the winning nominated centers. Please watch our facebook page for further announcements. Submit a nomination for your favorite PATH center member or PATH accredited equine therapy center by 12 pm EST, March 31, 2018. If we have already received a nomination for your center this year there is no need to submit another nomination. For complete Gypsy Gift information or to submit a nomination please visit GypsyGift.com. We are turning the dream of having a Gypsy Gift Horse in therapy programs across the country into a reality! Please join us in sharing our latest news! Click here to nominate a center to win a gypsy gift horse.